It’s been said that one of the hardest things to do is to write a sequel to a hit. The expectations are high, and it’s rare to recapture the same magic twice. I can only imagine this pressure is multiplied by a thousand when it’s an author who is writing a follow-up to a highly successful series. This is the challenge Rick Riordan takes on with The Lost Hero, a new book set in the Percy Jackson universe, and he delivers a perfect second act. What is The Lost Hero about? Jason wakes up on a bus at the Grand Canyon with no idea of who he is or how he got there. The girl sitting next to him, Piper, seems to be his girlfriend, and, Leo, who looks like a Latino Santa’s elf, says he’s a friend. When the trio narrowly survives an attack by monsters, they find themselves at Camp Half Blood, facing the new reality of being demigods. The camp is still not back to normal after the events from The Last Olympian, and, to top things off, the camp’s hero, Percy Jackson, has disappeared without a trace. Before Jason and his friends have a chance to settle in, they receive a quest from the Oracle, one that could lead to Jason’s memories and save Olympus from an evil force that is arising. I gave the book 4.5 stars based on good writing and engaging storylines. I’ve always enjoyed Riordan’s writing style, especially how he captures the voice of the narrator. This talent was on display in The Lost Hero, as he rotated the narration between the three main characters. I thought this would lead to some rocky transitions or inconsistent story telling, but it was completely the opposite. The characters came alive for me and kept me so entertained that I kept on reading late into the night. The other surprise was the book’s plot, as it was really interesting and does a great job setting up the rest of the Heroes of Olympus series. I wasn’t sure how Riordan would be able to revisit this setting and still make the story fresh, but the new characters and seeing the continuing aftereffects of the Titan War made it a fun read. The ending of the novel was well done, closing up the storylines from the book in a satisfying manner, while setting the table for the next book. If there was one negative about the book, it was that I don’t think we got a complete enough picture of what happened between the end of the Percy Jackson series and The Lost Hero. You do get some information throughout the book, mainly when characters refer to the events of the Titan War or just after. Still, without spoiling it for folks, I think that the lack of information about some of the characters was kind of weird. It’s possible Riordan addresses this throughout the rest of the series, so I didn’t really let it affect my rating. Who should read The Lost Hero? 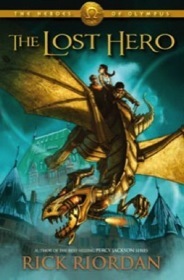 The Lost Hero is great Young Adult reading, and its age appropriate for kids age 9 and up. Obviously, fans of the Percy Jackson books will really enjoy this book, but fans of other YA series like Harry Potter or Artemis Fowl will also enjoy it. You also have a chance to check out the first two chapters for free. If you’ve already read The Lost Hero, what did you think of it? Did you like the new characters? Let me know in the comments.